In recent years, it has been realized that ERP systems and data warehouses are insufficient to really tackle the problem of inconsistent, inaccurate and unreliable data. In particular there is a growing awareness that the processes that create and update corporate data need to be addressed if the data dragon is ever to be slain. This involves understanding, documenting and controlling the business rules that surround the creation of new business classifications (such as a new customer code, a new product line or brand, an updated hierarchy of engineering assets or organizational structure). This is commonly termed Data Governance. • The governing body responsible for data policy relating to how data is defined, owned, stored, reconciled, deployed, and enforced. • The process for agreeing data ownership and rights and reconciling conflicts. • The embodiment of the organizational culture relating to the management of the decision making process. • The function targeted with ensuring data security and integrity across the enterprise. • The scope of data governance needs to extend to the semantics used in systems, to ensure consistency in the way that data is handled. 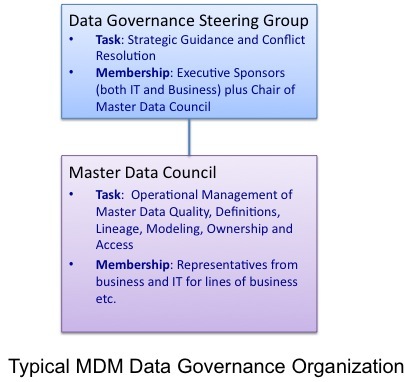 The following diagram illustrates the typical components and general structure of data governance required for master data management. Data governance is, of course, an umbrella term that is much broader than master data. It also encompasses such areas as archiving policy, and compliance with data protection laws and security policies as well as the quality and accessibility of data. Many organizations have attempted to address the governance of business processes and data, but few have genuinely succeeded. Documenting business models in some sort of data dictionary, or even on PowerPoint, is a useful start and can have many benefits but it is, essentially, a passive activity and gets quickly outdated. What is needed is for such descriptions of processes to be intimately linked with the systems that they involve. Data Governance is closely related to master data management. Managing master data is a business issue and responsibility. No longer should this be delegated to IT as is often now the case. Indeed, to be effective the governance process must be sponsored and led at the C- level in the business. The definition of the master data items and classifications is central to the business process and so must be managed by business experts who have the understanding of the business goals and strategy. The whole success of being able to understand and consolidate business data is dependent on the business taking an active role here. Choosing when, for example to classify frozen peas as a ‘garden vegetable’ or a ‘prepared food’ is a business decision, depending perhaps on the marketing strategy. Clearly not everyone in the business can decide this. There must be a process and business owners who are appointed by the business to take these decisions and resolve conflicts. This in turn needs to be supported by some form of workflow process. Putting in place an effective governance structure is essential to the success of a BI initiative. 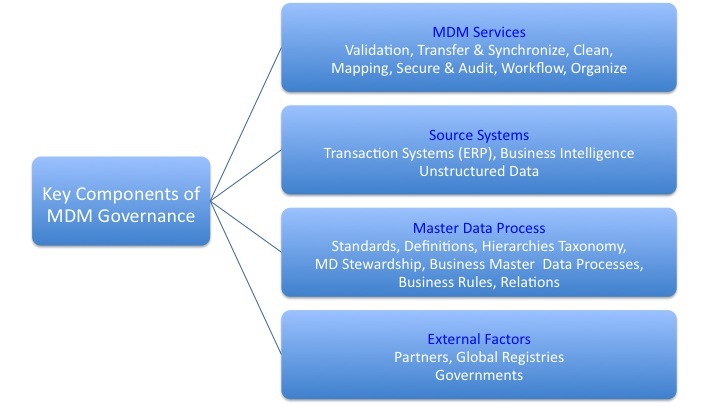 The following diagram illustrates the various aspects and tasks of Data Governance with particular reference to master data management. It’s important to understand from the outset that master data management initiatives and the associated data governance is not a project. The project is to set up an ongoing and efficient process for data governance and master data management. To be successful with governance and master data management initiatives the business must be fully committed to a long-term program supporting both the technology and process. Most companies will find if they look closely that they are already spending lots of money fixing problems arising from poor data so it makes economic sense to establish this as a process. Establishing effective Data Governance is essentially about introducing changes in the business processes by which businesses manage their key business data. Although to be successful it requires that appropriate supporting technology be put in place this is not the major challenge. Knowing how and where to start is usually the major worry and The Information Difference has a wealth of experience in tackling just this sort of issue. If you’re just about to initiate a data governance initiative or already have an initiative underway our experience could help you avoid some common pitfalls. Please contact us.